These seven summer sports do more than just give you a chance at a great tan — they also torch a crazy number of calories. All numbers are estimated by Harvard Health Publications and based on the weight of a 155-pound person. If you weigh more, you’ll burn even more calories when you put in the same effort. Or in this case, fun. 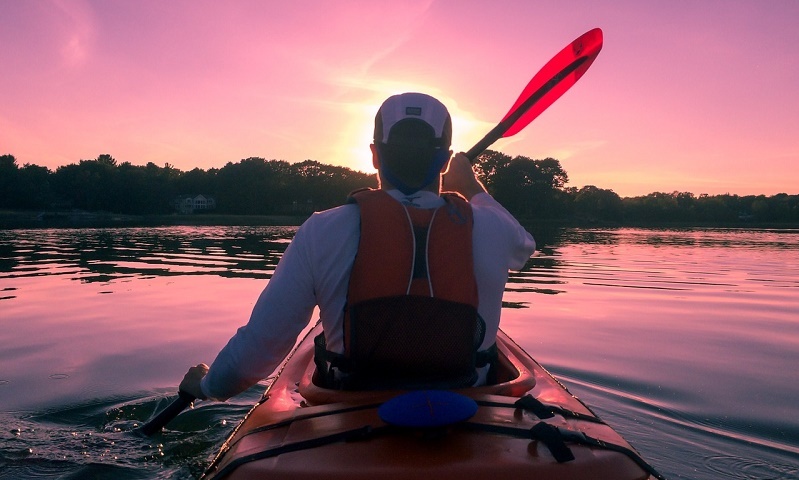 Summer means a chance to go paddling in your local waterways. Even though you’re “only” using your upper body and core to do the work, you can burn an impressive 342 calories per hour as you cruise along your favorite lake or calm river. If you’re into sea kayaking you’ll burn even more calories, because the swells, gentle as they may sometimes be, make you work harder. No kayak? No problem. An hour of relaxed swimming around in your favorite lake or pool will burn about 446 calories per hour. Crank it up to a vigorous, lap-style effort — even if you’re not actually in a lap pool — and you’ll torch more than 700 calories in the same amount of time. Everybody knows that walking is a great workout, right? Well, hiking is even better. The extra effort of managing uneven terrain and overcoming those pesky hills helps you burn 446 calories per hour. And since you’re likely to be out there enjoying the scenery for a few hours, those numbers really add up. Everybody knows that running is a great calorie-burner. (Just for the record, a 6-mph run will relieve you of some 744 calories in just one hour.) But if you don’t enjoy running for the sake of it, just toss a ball into the mix and kick it every once in a while: Voila, soccer! By the end of an hour-long game, you will have burned an impressive 520 calories. If soccer isn’t quite your dish, how about a game of flag football? You get all the fun with none of the worry about bone-crushing tackles from that one guy who’s “just playing around,” and you’ll torch a tidy 596 calories after just one hour of play. Team sports aren’t the only way to burn a crazy number of calories during the summer. Hop on your mountain bike, tackle your favorite trails for an hour, and you’ll come home 632 calories lighter. Believe it or not, the top calorie burner for summer doesn’t have anything to do with water, and it doesn’t even go very fast. Rock climbing burns an incredible 818 calories per hour, or the same as running 6.7 mph for an hour. (That’s a 9-minute mile.) You get that great burn because rock climbing engages all the large muscles in your body, from your hands down to your feet, in a continuous, prolonged effort.